Erin is a town in Chemung County, New York, United States. The population was 1,962 at the 2010 census. The town was named by early settlers from Ireland. The town is east of Elmira and is along the county's northern border. It is part of the Elmira Metropolitan Statistical Area. The area that would become the town was first settled before 1816. The town of Erin was formed in 1822 from the town of Chemung. The Scotchtown Cemetery was listed on the National Register of Historic Places in 2008. The Erin Volunteer Fire Department was founded on May 5th, 1955. Land donated by the late Merton Schanbacker was used to build the first fire station. Later in 1998 the current fire station was built adjacent to the original fire station. The current fire department operates with roughly 25 all volunteer members and 5 well equipped apparatus which include an EMS ambulance (882), a rescue truck (881), an Engine (831), a Tanker (861) and a brush truck (871). According to the United States Census Bureau, the town has a total area of 44.5 square miles (115.2 km2), of which 44.2 square miles (114.6 km2) is land and 0.23 square miles (0.6 km2), or 0.50%, is water. Newtown Creek, a tributary of the Chemung River, flows westward through the town. 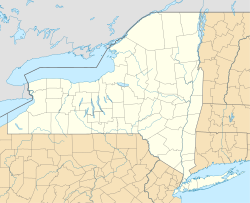 The north town line is the border of Schuyler County. New York State Route 223 passes through Erin village, and the town government is located on this highway. As of the census of 2000, there were 2,054 people, 751 households, and 608 families residing in the town. The population density was 46.3 people per square mile (17.9/km²). There were 794 housing units at an average density of 17.9 per square mile (6.9/km²). The racial makeup of the town was 98.59% White, 0.15% African American, 0.39% Native American, 0.39% Asian, and 0.49% from two or more races. Hispanic or Latino of any race were 0.44% of the population. There were 751 households out of which 37.2% had children under the age of 18 living with them, 64.7% were married couples living together, 9.5% had a female householder with no husband present, and 19.0% were non-families. 14.9% of all households were made up of individuals and 5.1% had someone living alone who was 65 years of age or older. The average household size was 2.74 and the average family size was 2.97. In the town, the population was spread out with 26.0% under the age of 18, 7.5% from 18 to 24, 30.2% from 25 to 44, 27.0% from 45 to 64, and 9.3% who were 65 years of age or older. The median age was 37 years. For every 100 females, there were 105.8 males. For every 100 females age 18 and over, there were 99.3 males. The median income for a household in the town was $41,795, and the median income for a family was $44,032. Males had a median income of $31,635 versus $21,520 for females. The per capita income for the town was $16,747. About 4.6% of families and 7.5% of the population were below the poverty line, including 9.7% of those under age 18 and 8.9% of those age 65 or over. Erin – The hamlet (and census-designated place) of Erin is in the south-central part of the town, located on NY-223 and Newtown Creek and County Road 4. Herringtons Corners – A former location in the south part of the town. Langdon Hill – An elevation in the southwest corner of the town. Park Station – A location near the north town line. South Erin – A hamlet in the southern part of the town. ^ a b "Geographic Identifiers: 2010 Demographic Profile Data (G001): Erin town, Chemung County, New York". U.S. Census Bureau, American Factfinder. Retrieved November 3, 2014. ^ Deigman, John (Dec 30, 1891). "Ireland in America". The Canadian Statesman. p. 2. Retrieved 14 October 2015. This page was last edited on 23 March 2019, at 11:52 (UTC).